We know that our clients retain the best legal, accounting, investment, and family office advisors in the country. These advisors rely on our knowledge, our dedication and our experience in managing the details and implementation of sophisticated planning concepts and in the design, implementation and monitoring of large life insurance portfolios. Our consultative approach, independence and collaboration with the advisor team allows clients to create specifically tailored, diversified funding solutions that meet their long term planning objectives. Our Private Underwriting Process enables our firm and our clients to access multiple insurance carriers simultaneously and discreetly using our Private Underwriting Questionnaire. 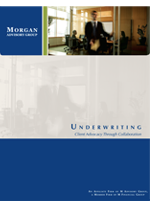 This provides our clients and our firm with control of the underwriting process and allows our potential insured’s to obtain the most competitive and favorable risk classifications prior to completing formal applications. More importantly, the process does not expose the potential insured’s or the market to negative results (if any) prior to submitting formal, signed applications. This is especially important if a potential insured has had any prior health issues or has a need to acquire significant blocks of life insurance coverage. Once we have received all of the preliminary (informal) offers, we will review the preliminary results with our clients and their advisors and they can make a determination on the most appropriate course of action. Only after this step will we have the client formally apply for the life insurance coverage.